Kimball Union Academy senior Mike Lombardi, a 1998 forward has committed to Quinnipiac University. The 6'1 180 pound forward out of Barrington, Rhode Island has played the last three years at Kimball Union under former University of Maine head coach Tim Whitehead. He has seen steady improvement each season going 6 points in 32 games in the 2014-15 season to 33 points in 35 games in the 2015-16. This season he leads the team in scoring with 31 points (12 goals and 19 assists) in 23 games played and is averaging 1.35 points per game and is also one of the captains of the team. The hockey recruiting website Neutral Zone had this to say about Lombardi. 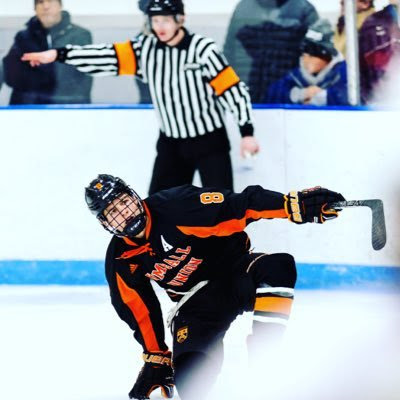 Lombardi also plays for the Boston Jr. Bruins Selects U18 team and has 22 points (9 goals and 13 assists) in 14 games played. He has yet to be drafted by a USHL team so there is a solid chance he will hear his name called in the 2017 Phase II draft this spring. I'd expect him to get more seasoning with either a USHL team or possibly a BCHL team for the next year or two before coming to Hamden. Lombardi is third future Bobcat commit out of the state of Rhode Island following Matthew Creamer and Matthew Fawcett. Here are some links on Mike Lombardi.